Sorry: This event concluded in April, 2014. 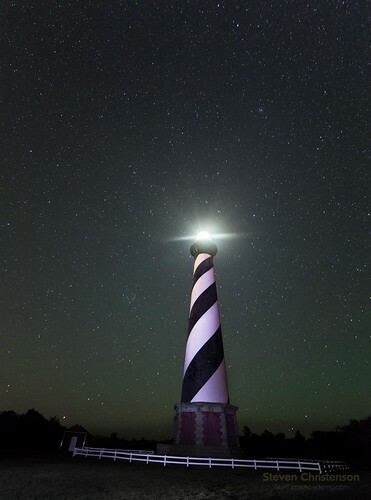 The skies are dark, the beaches are long and sandy, and there are dunes, migratory birds, windswept trees, lighthouses and much more on this lovely and remote stretch of the Eastern United States. This event is scheduled during the Lyrid Meteor shower so we will we have celestial fireworks, the rising Milky Way, dark skies and plenty of daylight possibilities as well, This is not a night-only workshop. There is so much to photograph and enjoy here that a week just scratches the surface. Sign up and pay in full now for the lowest possible rate. If we materially change any of the event details we’ll allow you two weeks to cancel and get a FULL refund. We do recommend travel insurance. Spring in North Carolina usually presents ideal weather. Where else can you going to find a workshop that includes meals AND oceanfront lodging for a week at this price? Only here, we think! We will start with a sunset on the first evening. Checkin is at 5PM and before we bother with dinner, we’ll get a acquainted and head out for some sunset activity. In the following days and nights not only will we photograph sunrises, sunsets, but also stars, star trails and the Milky Way from strategic and compelling locations, including from our oceanfront mansion. There are daily professionally prepared meals and plenty of instruction on photography, photo processing, and more. You’ll have a room with a private bath on the oceanfront where you can listen to and watch the surf. Just steps outside the door are lovely long sandy beaches and the Atlantic ocean. 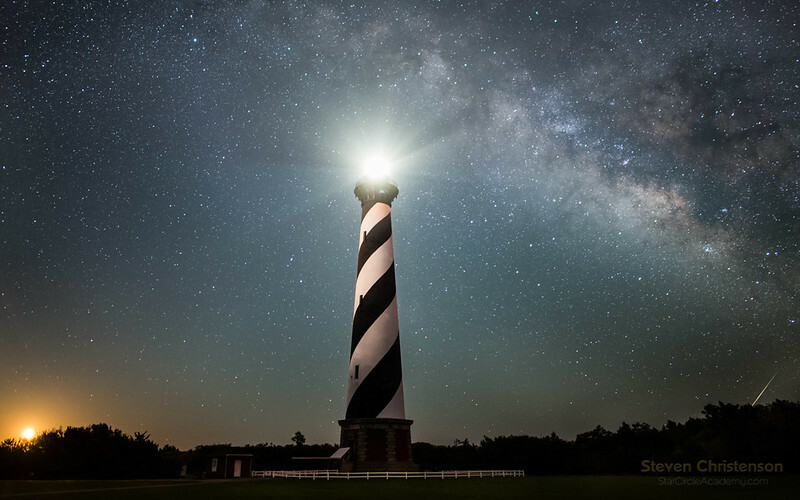 We will visit historic and picturesque locations like the Cape Hatteras Lighthouse – the tallest brick lighthouse in the world, the Bodie Lighthouse and it’s adjacent wildlife sanctuary, the towering dunes of Jockey’s Ridge, Kitty Hawk where the Wright Brothers made their first glider flights and Kill Devil Hill and the Wright Memorial where the first powered flight occurred. 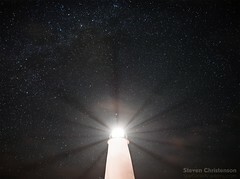 We’ll take a ferry to Ocracoke Island where we can visit truly huge unspoilt stretches of beach, try our hand at the Ocracroke lighthouse at night and take unusual images from aboard the ferry while enjoying the hour long ride on the Pamlico Sound. And we have a few surprises, too! If you wish, you can separately arrange to hang glide at Jockey’s Ridge, kayak on the Pamlico sound, race go carts at Rodanthe, take an aerial tour of the Outer Banks, opt for a sport fishing excursion, or just soak up the sun at the beach because the workshop includes built-in free time to unwind and let the awesomeness of the place unkink and relax you. Cost for the one week workshop is shown below (see Registration). There is a substantial discount for early registration. The workshop fee includes instruction, lodging and most meals (5 dinners, 6 lunches and 7 breakfasts) but does not include transportation or incidental expenses. You may bring a spouse or guest who shares a room with you at an additional cost. There will be a maximum of 10 workshop participants – assuming every room is double occupied. To sign up, see “Cost and Registration” below. The workshop ends at 10 am on Saturday, April 26th which will allow you time to get to late afternoon or evening flight, or be adventurous. How to find your way around the night sky. To sign up, see “Cost and Registration” below. The Outer Banks is remote which is one reason why skies to the east are very dark. The nearest airport is in Norfolk, Virginia (airport code ORF) and it is about 120 miles of very pleasant driving to our central location. A rental car is advised so that you can explore on your own, or you can arrange to travel with another workshop participant, or hire a shuttle. The closest large airport is Raleigh-Durham International (RDU) which is about 230 miles away. If you have the means, there are closer regional airports – the closest is Billy Mitchell Air Field (HSE) on Hatteras Island which can be accessed with a private or chartered aircraft. The town of Nags Head also has an local airport. To find more airports click here. We’ve seen weekly auto rental rates from RDU for as little as $13 per day, and round trip airfare to Norfolk from San Jose less than $600. While the rooms are all quite similar (King bed with adjoining bathroom), some are on higher floors with slightly different amenities. The first to pay in full gets the first choice of room. Participants are required to sign a liability waiver as a condition of inclusion. Using PayPal (our checkout system) guarantees that we process your registration in first come, first served fashion. If you are averse to using PayPal, you can contact us to pay via PopMoney (popmoney.com), QuickPay (chase.com), or similar direct payment method. We do not accept checks. You do not have to have a PayPal account to register, you can use a credit card. If you have any questions please contact us. The form below assumes you are booking a single room. If you want to book more than one room, please add to the cart more than once. A guest (2nd person in the room) is included in all activities. Want to Save MORE? Snag a room without a private bath and save. Only one person permitted in this room. Includes meals and instruction. We want you to be as committed to us as we are to you. If you elect to cancel your attendance the amount of refund you receive, if any, will depend on when you cancel. 45 days or more before the event (on or before March 4th): $500 is forfeit and the rest – if any – returned – NOTE it has now passed March 4th. less than 45 days before the event the entire workshop fee is forfeit and nothing is returned. You can, however assign or transfer your spot to someone else. If there is a person on the waiting list who agrees to take your spot, you will get everything back less transaction fees (about 4%). No interest will accrue on any payments. If for some unforeseeable reason we must cancel, you will receive a full refund of workshop fees paid. Wind, sand and surf are all present on the Outer Banks. Rain is also a possibility therefore we recommend that you bring your camera gear (both wide angle and telephoto lenses) as well as protection for that gear such as a rainsleeve. Bring a sturdy tripod, and an intervalometer. StarCircleAcademy will bring small equatorial mounts for you to try – just as we do with our Astrophotography 201 field event. Since humidity may also be a problem we recommend that you bring your own dew prevention system. We will have hand warmers available. Be sure to bring plenty of batteries, a battery charger. To get the most out of the classroom time, we also recommend that you bring your laptop computer with Adobe Lightroom and Adobe Photoshop installed. Insect repellent is also a good idea. The house is an eight-bedroom house in which 6 of the rooms are masters with King size beds and attached private bathrooms. Two additional rooms have double beds and a bunk and shared bathrooms. The instructor will be staying in one of those rooms. There is a hot tub on the second floor deck, a media room, a game room with a pool table and multiple decks all overlooking the ocean which is literally 100 feet out the back door. It’s not far from Rodanthe Pier. Smoking and pets are not permitted in the home. Each participant will have a private room with a king bed and a private bath. You may bring a spouse or guest who stays in the same room with you for an additional charge. Your guest will have full privileges to participate in the workshop. Rooms will be assigned in the order of receipt of full payment for the event. The first to make full payment gets first choice of room, the second to register the second choice… and so on. WiFi access, and linens are included. Chef Jamie Pauls will be maestro of meals for us. He comes very highly recommended. Detailed schedule (subject to change) will be sent to participants on April 3rd. Includes meal times. Got a question? Ask via email or leave a reply and we’ll answer them! Q: If I pay in full now, how does the cancellation/refund policy work? A: Please see “Cancellation Policy”, above. Q: What if I can only attend part of the workshop, can I get a reduced fee? Q: I’d like to attend, but I will stay somewhere else, what is the cost? A: Staying, eating and learning in the oceanfront mansion are part of the workshop. We are sorry, but we do not have an option to participate in the workshop while staying somewhere else. Q: What happens if I put a deposit down and the rates increase before I make my final payment? A: There is no option to make a deposit. Payment in full is required. Q: How can I get the lowest cost for the workshop? A: Pay 100% now! There is no other way. Q: I have a conflict. Will you do this again at some other time? A: Possibly, but we’ve got SO many great plans we can’t guarantee when we may schedule the next one. Q: Why should I book now? Q: Why is there an additional charge for a guest? A: We considered increasing the cost of the workshop for all by adding a “single supplement”, to cover our large upfront costs, but adding a small additional charge for a guest seemed like a good compromise. The additional cost is to cover fees, materials, food and food preparation for the second person who is a full participant in the workshop. A: You and your guest are not obligated to attend any event(s). There is no alternative pricing. Q: How much is airfare to Norfolk, VA, the closest airport? A: Obviously this depends on your point of departure and when you book travel, but we booked a single round-trip for less than $600 from San Jose, CA. Q: How much should I expect to spend on incidentals? A: Once you arrive there is very little you’ll spend money on. All entry fees are included. On two occasions we will be away from the oceanfront home during the evening meal and those meals are not included. We can’t think of anything else you’ll need money for unless you decide to go on an excursion on your free day. Of course you may also want to spend some time shopping in the galleries and gift stores in the area. Q: “Rodanthe” rings a bell with me, why have I heard of it before? A: First it’s prounounced roh-danth-ee, Richard Gere starred in the movie based on the book “Nights in Rodanthe” by Nicholas Sparks. The actual “Inn at Rodanthe” is a rental house less than a mile up the road from where we will be staying. If you go visit, beware as the short access road is heavily rutted. A: Hurricanes have struck the Outer Banks many times, but this event is well before hurricane season which is June to October so the chances of having a disruption due to a hurricane are very slim. Again, trip insurance is a good idea! Q: How close are we to the Wild Horses of the Outer Banks? A: There are actually several locations on the Outer Banks where you can find wild horses. We will be visiting one area on Ocracoke Island (the Banker Ponies) where they are penned in for their safety. There are two barrier islands far to the south near Cape Lookout. These are about a 4 hour drive each way not including one or more ferry rides. Perhaps the most famous are located north of the town of Corolla past the end of NC12. Off road vehicles are required to get there. You can arrange a private tour through one of many operators. 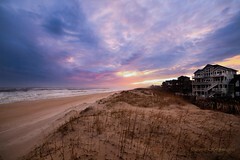 Most tour operators begin in Corolla. Corrolla is about an hour and 20 minutes north of Rodanthe. Tour rates are about $45 per person for 2-hour tours. If you arrive early to Norfolk, you might make it to Corolla in time to take a wild-horse tour before you head down to Rodanthe. We may decide as a group to go on an arranged tour at additional cost. Q: Is there anything else of interest I might want to see on my free day? A: Where to start! You may spot waterfowl and black bear in the wildlife preserve at Alligator River (about an hour north west), You might travel all day (about 5 hours each way) to visit the remote Cape Lookout lighthouse, go kayaking on the Pamlico sound, sport fishing, visit the wild horses in Corolla (see earlier questions) or … you name it! Q: Is there a good resource for learning more about the Outer Banks? A: Yes, OuterBanks.org is quite good. Q: Won’t there be a lot of moonlight? The moon is 80% full on the 19th. A: Through the week the moon rise grows later each night. By the last day of the workshop, the moon doesn’t rise until 4:45 AM and is only 8% illuminated. In other words, there will plenty of hours of complete darkness every evening. And better yet, there will be some moonlight which is great for those who want to stay up in the wee hours and get some natural light on your scene. Oh, and a moonrise over the ocean with a Milky Way above… that will be a great shot! Would you like to see all events for this year? Check here. Is dew a likely problem when we will be at the outer banks and it would be advisable to invest in a Dew-Not controller and wraps? It’s been a couple of year since you wrote the Power On – all night article. In regards to external battery power sources are you still pleased with using the BP-970 batteries as a source for the coupler? There are many solutions to a possible dew problem. If you are planning to travel by air, you probably won’t want to bring (or may not be allowed to bring) a large lead acid battery. You should be able to bring a quantity of iron/charcoal hand warmers and use those – there might be some available in VA or NC sporting good stores, too. I will be bringing a quantity of hand warmers, perhaps not enough for everyone, so I recommend you bring some of your own. Unfortunately all of the pre-made systems I am aware of expect 12 volt power and there are few options other than lead acid and sealed lead acid batteries – but THIS Anker with 12V output looks promising. You could pair it with an appropriate sized Dew-Not system. I do not have this system, so can’t vouch for it. You can also not worry about dew at all. Where dew is a particularly pernicious problem is with timelapses or star trail exposures. If those aren’t of interest to you, then you can manually check your shots and wipe down your lens when dew begins to collect. As for the CamCorder batteries, I seldom use them anymore. One reason is that I left a whole batch of fully charged ones in a hot car and that killed their capacity! Steve – I recently purchased a Paul Buff Mini Vagabond inverter that delivers up to 120 watts AC as well as 5V via a USB and 14 volts via the Anderson connector, which is also used as a charging port. I have successfully tested it with a Kendrick Dew Controller, Dew-Not lens heater and Canon AC LP-E6 battery eliminator. Unlike the Anker, it doesn’t loose 1/3 of its power converting to 12 V. The Buff delivers directly from a high discharge rate Lithium Ion battery, and appears to have more than ample capacity for an all night session.